The area known as Old Algiers, nestled in the curve of the Mississippi River's west bank (which incidentally is not west of the rest of the City of New Orleans), was established in 1719, making it the second oldest part of the city. When granted to Jean Baptiste LeMoyne Sieur de Bienville, it was originally part of the 'King's Plantation' that stretched from Plaquemines to Donaldsonville and then to Natchez, Mississippi. Native Americans lived along the river banks before it was settled by the French. For nearly a century and a half, the area served as the place where African slaves were held before they were sold into a lifetime of slavery. Some scholars argue that this place is actually sacred ground, the site of the origins of jazz. The slaves -- frightened, sick, isolated from the families -- quite likely used their tradition of 'call and response' and single-line melodies to communicate and comfort themselves and their families. These sounds form the basis of jazz today. During the years of building New Orleans, Algiers became the site of the city's powder magazine, for which Powder Street was name. The city's slaughterhouse was also located in Algiers, called Slaughterhouse Point in its early history. In 1769, the Spanish took control of Louisiana, and they sold the Algiers land to homesteaders who established large farms and plantations. Two of the most famous of these early landowners were Barthelemy Duverje, who owned most of the property that is now called Algiers Point, and John McDonogh, who lived between Newton and Homer Streets. Several communities developed over the years, including Duverjeville, Belleville, Brooklynville, McDonoghville, LeBeoufville, and Hendeeville. Around 1819, shipbuilding and ship repair operations set up along the riverfront. Later, related industries such as saw mills, lumber yards, dry docks and an iron foundry added to the commercial vitality. By mid-century, most residents depended on the shipbuilding industry for their livelihoods. The United States Naval Station was sited in Old Algiers in 1848, and large tracts of land were purchased. By 1894, the facility was in operation and continued to expand until after World War II. For many years, it was the largest employer in Algiers. Old Algiers further prospered with the development of the railroads in the 1850s. At one point, there were 4000 men working in railroad-related jobs. The railroad yard stretched 22 blocks across Old Algiers in the area that now houses the Riverpointe development, Port Cargo and other industrial uses. During the Civil War, Algiers warehouses were burned and Union troops set up camp in the area. Freed slaves established their own communities in Old Algiers, primarily in the McDonoghville area and Freetown, which will established by John McDonogh for his own slaves, whom he emancipated, and other free people of color. McDonogh left his considerable wealth to develop a public school system in New Orleans, including McDonogh 32 in Old Algiers. The Great Fire of Algiers in 1895 destroyed approximately 200 homes in the Algiers Point area and the Duverje Plantation house, which was being used as the courthouse; however, new structures took their place, and soon after the turn of the 20th century, Old Algiers was thriving. For entertainment, Algerines went to theatres, such as Philip FOTO's Market Theatre and the Folly Theatre, where they could enjoy vaudeville, silent movies and music. There was a lively jazz and burgeoning R&B scene along Newton Street and Teche Street, as well as in the locations such as the Masonic lodges and Knights of Columbus dance halls. Many musicians famous in their day, such as George Lewis, 'Kid' Thomas, Peter Bocage, the Matthews Brothers, Freddie Kolhman, Clarence 'Frogman' Henry and others, plied their trade in these establishments. 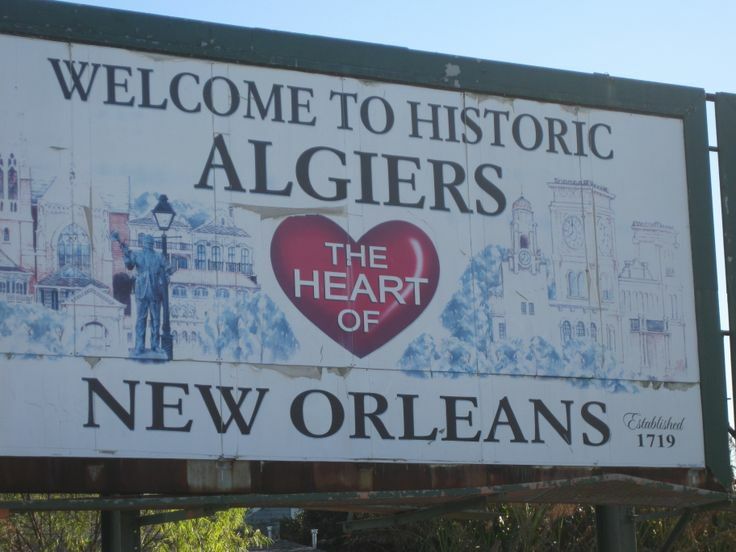 Old Algiers remained fairly self-sufficient through the first half of the century, with corner stores, schools, churches, bars, restaurants and theatres, but when the railroad yard closed in the 1970s and the oil industry started to shrink, the area suffered from neglect. It would be 20 years before parts of the area began to come back, with renovators scooping up the real estate. Parts of Old Algiers remain neglected, but with the help of a variety of programs, including the Old Algiers Main Street Corporation, new focus is being placed on recreating a thriving Old Algiers community. There are a variety of historically significant commercial and residential buildings in the OAMSC program area; many relate to the area's contribution to early 20th century Jazz. Pride of Algiers Masonic Lodge #102 - one of the oldest African American Masonic Lodges in the nation. The building has housed the group since 1957. Philip Foto's Market Theatre - a former vaudeville and silent movie theatre. It now houses a grocery store. Greystone Voter's League - an important gathering place before and during 1940s and 1950s, where jazz and R&B legends performed, including Professor Longhair, Ray Charles, BB King and the Neville Brothers, played. L.B. Landry home - L.B. Landry was the first African American physician in Algiers. He was also a musician and civic-minded citizen, who has had a school and street named after him. Greater Providence Baptist Church - The church was begun in 1898. A preacher known as 'Black Billy Sunday' was pastor there for several years. Red Allen House - The PRC-renovated birthplace of Henry 'Red' Allen, who formed the Excelsior Brass Band and who played with King Oliver, Fletcher Henderson, Jelly Roll Morton and Louis Armstrong. Mt. Pilgrim Baptist Church - one of the oldest churches in Algiers and an oft-photographed church in the background of jazz funerals. All Saints Catholic Church - the first African American Catholic Church in Algiers, still in operation today. Whitey's Ballroom (trombonist Whitey Dollinger), Kohlman's (drummer Freddie Kohlman) Bar, Rita's Bar (home of the Mohawk Hunters Mardi Gras Indians) and several homes of important early jazz musicians such as the Mathews brothers. Peter Bocage House - the family home of early jazz trumpeter Peter Bocage is located on the corner of Vallette Street and Newton Street. Bill Matthews House - located at 717-719 Newton Street, was an important drummer in the early 20th Century Jazz scene. Mardi Gras World - located at 233 Newton Street, Mardi Gras World is where spectacular Mardi Gras floats are made and stored for use in New Orleans and around the world. This may be the site of a new residential/retail development now under consideration for a zoning change by the City of New Orleans. We would like to thank Abba Parts & Service for the website funding support.